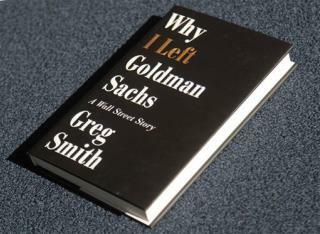 (Newser) – Greg Smith's new book bashing former employer Goldman Sachs has been met with a yawn, its critics complaining that it contains no bombshell revelations not found in his celebrated New York Times op-ed. "Everyone already knows the 'squid' isn't on the side of the angels," writes David Weidner at MarketWatch. But Matthew Yglesias at Slate thinks there's value in being outraged over things "everyone already knows," and indeed, thinks we need to revive the concept of moralistic outrage in general. In the media a successful business is one that shows the best bottom line. Yet all the businesses the do a Profitable business with Integrity, service and a quality product. As well as providing benefits for their employees. are seldom referred to in the media. Hey, express all the social outrage you want While Big Money goes laughing all the way to the bank.